La Galette in Copenhagen is a nice, romantic French restaurant, right in the middle of it all… Well, behind it all. It’s not that easy to find… I found it by mistake actually. These narrow streets are packed with bars, restaurants, tattoo shops etc. It’s usually quite busy with all kinds of people sitting on the stairs around, biking their way through or walking from one bar to the next. You’ll find this restaurant between a few others and you need to enter through a small gate where drawings of Obelix and Asterix take up most of the space. Walk a few meters in and enter a yellow building on your left. The concept is pancakes – plain pancakes, savory pancakes with different kinds of filling and of course pancakes for dessert. The French chef in the kitchen really knows his stuff. It might be because the kitchen is semi open and you can hear the staff speaking French, but you can really get that Bretagne-feeling here. The owner is actually from Paris himself and the staff, the surroundings and the small tables with candles on them, make the visit original and romantic. I recommend the goat cheese and spinach pancake together with apple cider – That’s always a winner if I feel a bit hungry. Or any of the dessert pancakes if you need a good night snack after a long day. 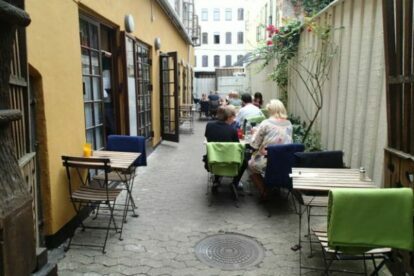 Another pancake restaurant that I can recommend is La Petanque on Israels Plads.